Allow 1Â¼ pounds of turkey per person. There are three ways to thaw your turkey safely â€” in the refrigerator, in cold water, or in the microwave oven. Check your owner's manual for the size turkey that will fit in your microwave oven, the minutes per pound, and power level to use for thawing. Set your oven temperature no lower than 325 Â°F. For optimum safety, stuffing a turkey is not recommended. For more even cooking, it is recommended you cook your stuffing outside the bird in a casserole. Use a food thermometer to check the internal temperature of the stuffing. The stuffing must reach a safe minimum internal temperature of 165 Â°F. If you choose to stuff your turkey, the ingredients can be prepared ahead of time; however, keep wet and dry ingredients separate. Chill all of the wet ingredients (butter/margarine, cooked celery and onions, broth, etc.). Mix wet and dry ingredients just before filling the turkey cavities. Fill the cavities loosely. Cook the turkey immediately. Use a food thermometer to make sure the center of the stuffing reaches a safe minimum internal temperature of 165 Â°F. A whole turkey is safe when cooked to a minimum internal temperature of 165 Â°F as measured with a food thermometer. Check the internal temperature in the innermost part of the thigh and wing and the thickest part of the breast. For reasons of personal preference, consumers may choose to cook turkey to higher temperatures. If your turkey has a "pop-up" temperature indicator, it is recommended that you also check the internal temperature of the turkey in the innermost part of the thigh and wing and the thickest part of the breast with a food thermometer. The minimum internal temperature should reach 165 Â°F for safety. Tuck wing tips under the shoulders of the bird for more even cooking. This is referred to as "akimbo." Add Â½ cup of water to the bottom of the pan. If your roasting pan does not have a lid, you may place a tent of heavy-duty aluminum foil over the turkey for the first 1 to 1 Â½ hours. 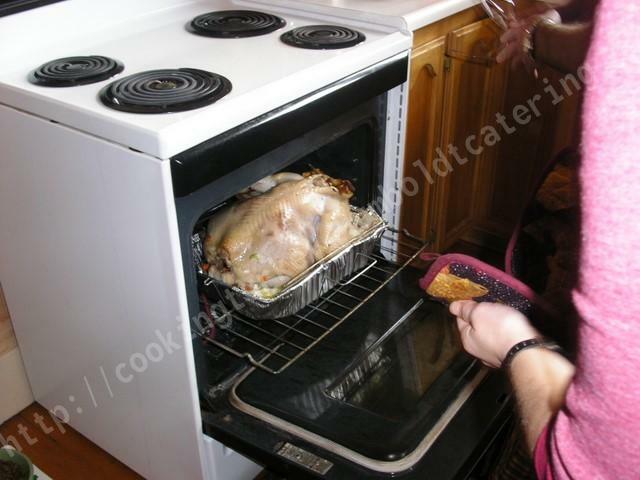 This allows for maximum heat circulation, keeps the turkey moist, and reduces oven splatter. To prevent overbrowning, foil may also be placed over the turkey after it reaches the desired color. If using an oven-proof food thermometer, place it in the turkey at the start of the cooking cycle. It will allow you to check the internal temperature of the turkey while it is cooking. For turkey breasts, place thermometer in the thickest part. For whole turkeys, place in the thickest part of the inner thigh. Once the thigh has reached 165 Â°F, check the wing and the thickest part of the breast to ensure the turkey has reached a safe minimum internal temperature of 165 Â°F throughout the product. If using an oven cooking bag, follow the manufacturer's guidelines on the package. Discard any turkey, stuffing, and gravy left out at room temperature longer than 2 hours; 1 hour in temperatures above 90 Â°F. Set the oven temperature no lower than 325 Â°F. Reheat turkey to an internal temperature of 165 Â°F. Use a food thermometer to check the internal temperature. Check the internal temperature of your food with a food thermometer to make sure it reaches 165 Â°F.